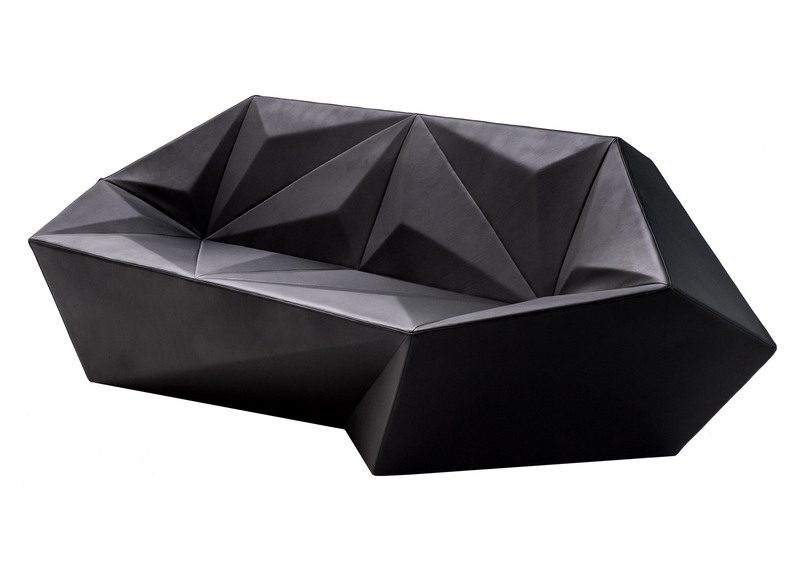 Architect Daniel Libeskind has designed a new line of seating for Italian furniture brand Moroso, featuring sharp angles and faceted forms inspired by crystals. Called Gemma, the collection is intended for commercial and residential use. It features a chair and sofa, along with a seating system that could be used in public spaces such as airports. Moroso described the pieces as "an exercise in architecture on a small scale". Libeskind's initial piece for the collection, the Gemma chair, made its debut last year at the Salone del Mobile fair in Milan. The Polish-American architect collaborated on the line with Patrizia Moroso, creative director for Moroso, whom he described as a business woman with an artistic mind. "When she looks at a design, when she looks at a drawing, she understands what it can be," he said during a launch event last week in New York. "She doesn't just look at it and think, how much money can it be sold for, how much money is going to be made." "She is an artistic person who has an eye, a vision, an intellectual idea of design," he added. Featuring hard edges and asymmetrical shapes, the Gemma collection takes its cues from precious gemstones, particularly crystals. These have long been a source of inspiration for Libeskind, who established his eponymous studio in Berlin in 1989 and later relocated the firm's headquarters to New York. "You look right through the surface into the depth of a crystal," the architect said. "A crystal is almost a metaphor of life because the form, the shape, the idea of a crystal has to do with an inversion of surface and depth." "I like sharp, angled forms that have a projective power," he added. "[Crystals] don't really have a back, they don't really have a ground. They are in free space." Framed with steel, the new pieces for Moroso are upholstered in a soft, knitted ombre fabric that morphs from dark to light. Coloured leather upholstery is also available. "Gemma represents the synergy between the complex geometries for which Libeskind is known, and the highly respected craftsmanship of Moroso's upholstering abilities," the company said. The steel framing was developed in collaboration with Feruglio Engineering. Libeskind's recent architectural projects include the Mons International Congress Centre in the Belgium and the Dresden Museum of Military History in Germany. While based in New York, he has a studio in Milan called Libeskind Design, which specialises more in interiors, products and industrial design. Libeskind and Moroso first worked together in 2014, when Patrizia Moroso asked the architect to help create seating for a performance piece by her friend, artist Marina Abramovic. For the performance, titled Counting the Rice, the architect designed a combined seating and table unit made of wood and later concrete. The installation involved participants sitting at the table for a minimum of six hours, while separating and counting lentils and grains of rice. The performance was staged at the 2014 Salone in Milan and later that year at Miami Art Basel. Moroso sold a limited edition of the furniture, with proceeds benefiting the Marina Abramovic Institute in Hudson, New York. Other Moroso pieces by high-profile architects and designers include the Double Zero chair by David Adjaye, two sofas by Ron Arad, and the Husk chair by Marc Thorpe.